Spread holiday cheer without overspending on needless stuff. Shopping for an appreciative 10-year-old can be a fun excuse to roam the toy store or share your favorite childhood book. Shopping for a 40-year-old can be a chore. That’s because your adult friends and family members probably don’t need gifts, and you'd rather not spend more than necessary during the holiday season. 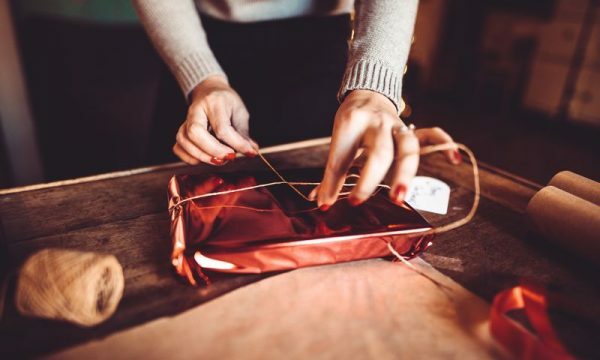 The average American who plans to buy gifts this year expects to spend about $660, according to a recent online survey commissioned by NerdWallet and conducted by Harris Poll. You probably don’t intend to pressure friends and family. Maybe you even insist that you don’t need a gift in return. But “that reciprocity has an enormous psychological pull,” Klontz says. There's no need to denounce gift-giving and, while you’re at it, the holiday spirit. Just consider alternatives to store-bought gifts and try to limit your list — so you’re not forced to pay January rent in Kohl’s Cash. For family, Klontz suggests agreeing to buy gifts only for the kids. Adults can exchange names and buy one gift, rather than several. And push for a spending cap on purchases. “That takes away some of that social pressure and likelihood of overspending,” he says. You can also exchange homemade gifts. Klontz’s grandpa, for example, used to make spaghetti sauce for his friends. If you don’t like making stuff, maybe your family could deem homemade gifts from craft fairs acceptable. Just remember that price cap, so no one spends $100 on a painting and receives a macaroni necklace. These gift-giving alternatives save you and your loved ones money, but they may also break tradition. If you’re worried about how your family will react to the potential change, “take responsibility for it,” Klontz says. He suggests saying that you’re trying to save money or rework your budget. You might need to initiate separate conversations — one with your nuclear family and others with individual friends who usually give you gifts. If you and your friend enjoy buying each other holiday gifts, and you can afford to do so, “that’s totally fine,” Klontz says. But Klontz says many others will “breathe a sigh of relief” and welcome a new, cheaper way to give gifts. Holiday expenses can add up quickly. Sign up with NerdWallet (it’s free!) to track all of your spending in one place.